Control Access: There are products that can block the bottom of your ladder, allowing you to grant access only to those with permission to ascend. Guard Access Points. Protecting hatches and rooftop ladders is just as important as restricting access. Make sure you have selfclosing gates in all appropriate areas. Prevent Falls During Ascension. Are your employees and contractors anchored as they ascend and descend from the roof? Eliminate Trip Hazards. You can do this by making sure the area near the edge is clear and installing an OSH-compliant safety rail system. Bolster Ladder Safety. Is there a railing on either side of the top of your access ladder? If not, rails should be installed. Keep Workers Secure. There are many added measures you can take to ensure that workers are protected from falls off the edge, like clearing obstruction and using lifeline systems. Evaluate Risk. Look for any edges or open sides near equipment, and determine how close it is. Provide a Barrier. If equipment is too close to the edge, a railing system is ideal for protecting service workers. Surround Hatches. Hatches should not be left freestanding without barriers around them. 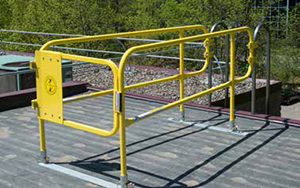 Many railing and gate systems are designed specifically for rooftop hatches. Cover Skylights. Can a rooftop worker fall through your skylight? Make sure you are using a strong screen to completely cover your skylights and other openings that workers can fall through. Check the Lights. Do you have any lighting on your rooftop? If you already have a railing system, are there warning lights along the rails to ensure safe nighttimework? Look at the Topography. If there are no rails surrounding hatches and other protrusions and no screens to cover openings, workers cannot safely walk across your rooftop.